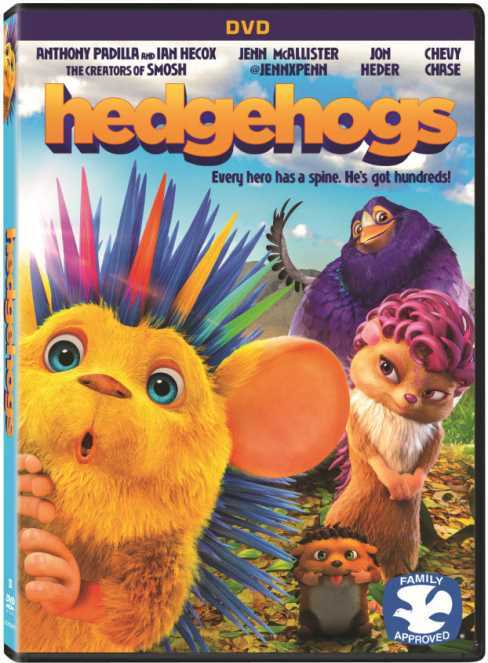 The animated family adventure Hedgehogs arrives on DVD and Digital February 27th from Lionsgate. 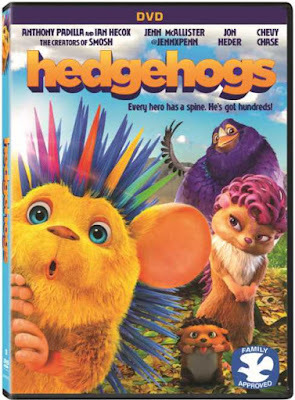 Awarded the Dove Seal of Approval, Hedgehogs follows a mischievous hedgehog named Bobby (voiced by Anthony Padilla of Smosh) and a pigeon named Hubert on a wild journey. In this outrageous family adventure, Web superstars @jennxpenn (Jen McAllister) and the Smosh duo (Anthony Padilla and Ian Hecox) join forces with comedy legends Jon Heder (Napoleon Dynamite) and Chevy Chase (Caddyshack). The laughter begins as a mischievous hedgehog named Bobby leaves his wilderness home and joins Hubert, a featherbrained pigeon, on a wild, unpredictable journey. They make their way to the big city, where stressed-out humans are losing their minds. Bobby and Hubert must calm the nervous citizens by being their cute, cuddly selves. I'd like to win for my nephews. It looks like a cute dvd. We would like this DVD because it looks like a cute family movie. I would love to win this for my kids. It looks like a fun movie to watch. I'd love to win this to save to give to & enjoy with our grandson Ashton, as one of his gifts on his 1st birthday this March! That Hedgehog looks adorable!!! His cool funky hairstyle reminded me of how our daughter, Ashton's mommy loved Treasure Trolls & their crazy hair SO much that when she was Ashton's age, I made her whole 1st birthday Treasure Trolls theme back in 1993. Plus, My husband & I both crazzzy love all animals (even cartoon ones haha) and we've gone to many animated movies on dates, just the 2 of us, but now that we have our 1st grandchild & we are SO excited to share our love our animals and cute fun movies with him too. Also BIG fans of Jon Heder! and our daughter, Ashton's mama, loved Napoleon Dynamite too. So did we. Thanks for the giveaway, it's fun to have a chance. I would love to win this for my 3 kiddos. This would be for my grandson who is turning 5. My kids would love to watch this cute movie with me!! I would love to win because I have 5 grandsons that love movies. (and animals) We have movie night 2 times a month so this would be a great movie. Growing up we had a hedgehog...oh he was so precious!!! This looks like such a fun movie for the whole family to watch together. Both of my children would love this movie! I'd like to win because I like hedgehogs. My Granddaughter is so excited about this movie, I would love to win for her and she can play it for her friends when they have movie afternoon on the weekends. I would like to win this prize for my son. He got so excited from the picture, I know he'd love it. I want this movie for my granddaughters. I would love to win to watch this movie with my nieces! It looks like something they would really enjoy! These guys look so adorable; my new little buddy will love them. I would like to win this for my little girl she has never seen this movie. I want to win this for my grandchildren; they will love it! I would like to win this for my sweet granddaughter. This looks like a cute movie. I think my little girl would enjoy it. This looks super cute and I know my kids would love this! I would like to win because this movie looks so cute and I would love to watch it with my niece and mom. Forty-two years of being a Chevy Chase fan should count for something! My boys would love this movie. They love and watch animal characters movies all the time. New animal,Hedgehog would be new to their vocabulary. I would love to win because I know my granddaughter and I would love to see this together! My grandson would be crazy about this movie! I'd love to win this to watch with my grandson when he comes to visit. treasuretoday@aol.com Pam C.
I would love to win because I think my granddaughter would love it! I'd like to win because my nephew would enjoy this movie! Our family loves movies we can all watch together.